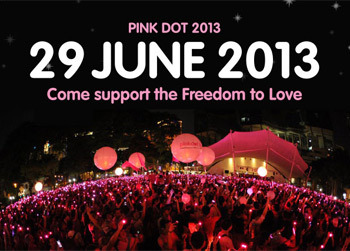 The fifth annual event to support the freedom to love will be held on June 29. Singapore's only pro-LGBT rally will mark its fifth year on Jun 29 at Speaker's Corner at Hong Lim Park, the only venue in the city-state where demonstrations of any kind can be held. Like the 2012 event, the rally this year will be held at night as the park will once again be "turned into a sea of bright, shimmering, pink lights", says the announcement by organisers today. Since the inaugural event in 2009 which attracted 2,500 people, the event last year was attended by an estimated 15,000 people making it the largest rally at Hong Lim Park. Activities will commence at 4pm; dot formation at 7.30pm. More details to come! Let's hope the Singapore police are more gay friendly this year than the homophobic Sydney police out in force this year for Gay Mardi Gras. It's a scandal in Australia, and already we are hearing reports about cancelled overseas travel bookings for '14 Mardi Gras!